Thanks to our lovely customers keeping us company over on Twitter, it's now easy to know precisely what to look for when it comes to spotting the symptoms of Raynaud's disease! With so many ways to describe Raynaud's Disease a.k.a Raynaud's Syndrome a.k.a Raynaud's Phenomenon, you're probably already confused about precisely which symptoms to look for. Are you supposed to be looking for white fingers and cold hands like one site says, or blue toes and cold, white feet according to another? 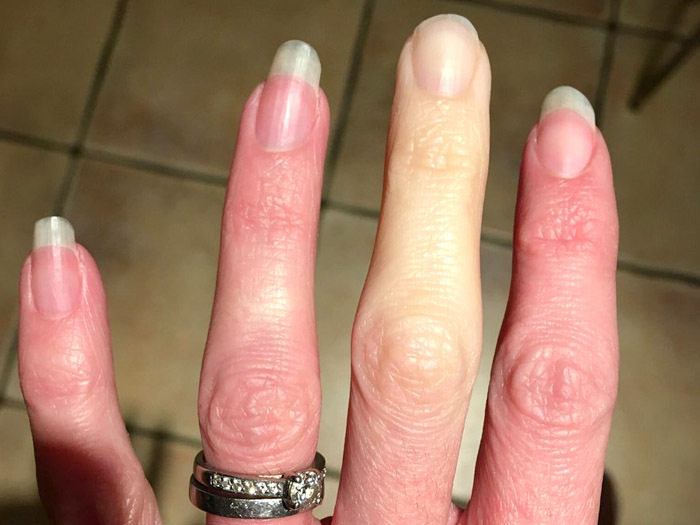 A picture speaks a thousand words so our Raynaud's symptom photos are here to show you precisely what to look for if you're worried about this cold condition! Living with Raynaud's may not be doing your dexterity any favours, but you can help raise awareness for this little-known disease by sending us handy photos of your Raynaud's-affected hands!